Actor Jimmy Carey added the latest drawing to his collection of latest politically-charged artwork on Thursday, this time depicting an oil rig exploding over a shirtless President Donald Trump. “THIS JUST IN! 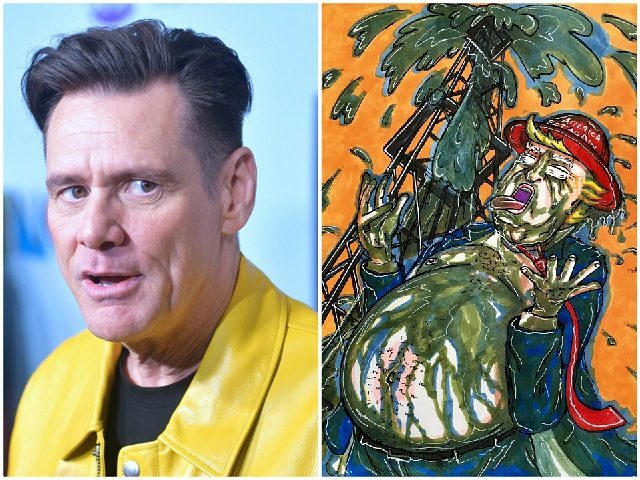 GROSS GOON STRIKES MORON MOTHER LODE!” Jim Carrey wrote on Twitter, accompanied by the image of a shirtless Trump lapping up the gallons of oil rain down on him from a nearby well. It is not clear exactly which of Trump policies the artwork is referring to, although it may be to do with Trump’s praise of America’s natural gas and oil production during his State of the Union address on Tuesday evening. Carrey’s latest offering touched on questions of energy and the environment in his artwork, with other drawings focusing on issues such as illegal immigration, the media, and racial justice. The 56-year-old actor recently claimed that the drawings represent his way of dealing with the “nightmare” of life under the Trump presidency in a “civilized” fashion.